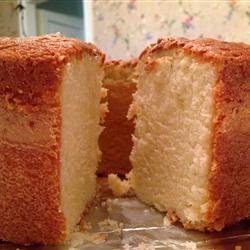 "Tangy, moist, and flavorful pound cake. Can be eaten plain or use as a base for numerous dessert ideas." Bake in preheated oven for 90 minutes. Do not OPENoven door until after one hour. When cake begins to pull away from the side of the pan it is done. Let cool in pan for 10 minutes, then turn out onto a wire rack and cool completely.